We love and miss you every day. Each day that goes by we think of you and your cute little chubby face, your smile, your cry. We thank God for the time we had with you even though we believe it wasn’t long enough. We know God needed the perfect angel and he found one in you. We haven’t been able to bring ourselves to visit you, but we do visit you often on this web page. We thank God for this web site. It doesn’t seem like it has been 2 years, but it has. We bought a little toy to put next to you. We plan on taking it to you when we can make it there. We love you Kayla. You are never forgotten. You will always be in our hearts as our niece and our little guardian angel. 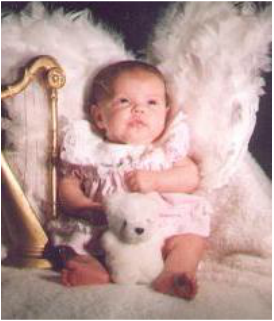 Kayla will forever be our angel. She will never be forgotten. She is no less a part of our family because she is gone. We are glad we had the time with her that we had even though it was short. We would never take it back. She will always be mom’s butterball & dad’s little girl. We know we can’t have her back. She will always be loved & missed by all who knew her. We are sorry she had to leave us so soon. She will always be by our side as we work, sleep, etc…I know she lays with us at night while we sleep giving us hugs & kisses. She plays by our sides as we read our paper & watch TV. I know this for a fact because she is our little angel. Can’t you tell by her wings?